BE ALERT! Some registrants have received phone calls warning that the hotel is nearly full, or suggesting that they can provide a cheaper rate. These calls are a scam, and are not endorsed by the hotel or by the Fermi Symposium. We will never ask for your credit card information over the phone. Please treat all such communications with extreme caution. This symposium follows previous Fermi Symposia at Stanford, CA (February 2007), Washington, DC (November 2009), Rome, Italy (May 2011), Monterey, CA (November 2012), and Nagoya, Japan (October 2014). On Friday afternoon after the Symposium, there will be an informal multifrequency workshop to plan ways to optimize the Fermi and multifrequency observations to answer key open scientific questions. If you would like to attend, or even if you would just like to offer your opinions on this topic, please fill out the short questionnaire at https://confluence.slac.stanford.edu/x/JY-OCw. This link will serve as registration for this workshop, so please remember to provide your name. On Friday afternoon, the GammaSIG will hold a splinter meeting to continue work on preparing a gamma ray community roadmap and to prepare input for the next decadal survey. In addition to presentations on the status of the roadmap efforts, there will be time set aside for open discussions. It is hoped that this will also afford an opportunity to engage not only the US community, but also the various international communities in this important endeavor. The agenda for the GammaSIG splinter can be found here. Questions or suggestions should be addressed to Mark McConnell. 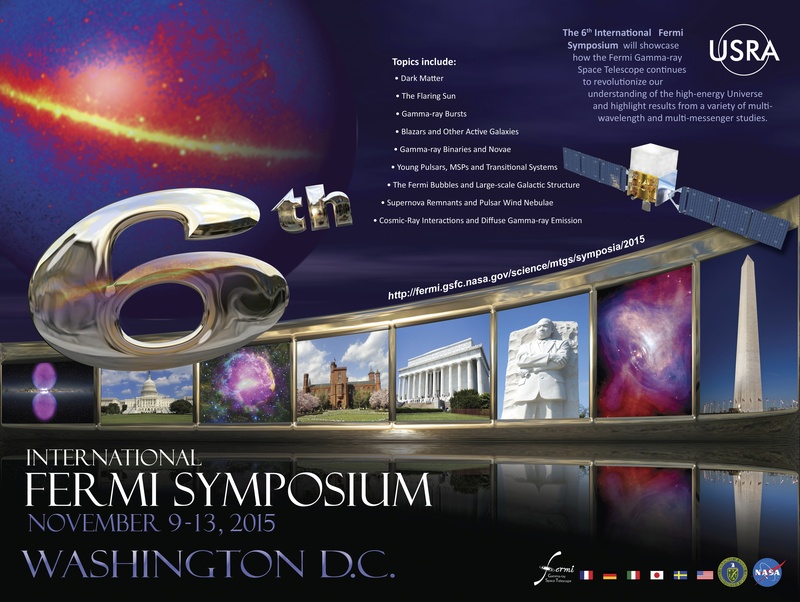 Universities Space Research Association (USRA) is sponsoring a student poster contest during the conference. Both undergraduate and graduate students are welcome to enter the contest. If you wish to have you poster judged for the USRA poster contest, please inform the staff at the registration desk. They will provide a sticker to mark your poster for judging. Winners will be announced at the conference banquet on Wednesday night. The Fermi Gamma-Ray Space Telescope and the Maryland Institute College of Art (MICA) proudly present a series of short animations that explore some of the fascinating discoveries made by Fermi through the lens of art. Each animation will be introduced by a scientific expert in the field. At the end of the event, there will be an opportunity to ask questions to both the scientists and the artists who participated in this endeavour. Grab your tickets. Posters must be no larger than 44 inches or 113 cm wide. Posters may put up Monday morning and must be taken down by the last session on Thursday. Meeting logistics are in development. Information will be added as it becomes available. Any onsite registrations will be collected by credit card only; Master Card, Visa, Discover, American Express. The 6th Fermi Symposium will be held at the Sheraton, Pentagon City in Arlington, Virginia, just across the Potomac River from Washington, D.C. The hotel is located next to the Pentagon and Arlington National Cemetery, the former estate of Civil War general Robert E. Lee, and the home of the Tomb of the Unknowns. As the Veteran's Day holiday (November 11th) will occur during the Symposium, there will be a number of memorial events occurring in the area. The Sheraton room rate is $177 (+tax) per night for a king or double room. Discounted breakfast tickets will be available for purchase at check-in. Meeting attendees not staying at the hotel will also be able to purchase breakfast tickets each day of the meeting at the check-in desk. Book rooms at the special rate before October 16, 2015. Note that guests who check out prior to their confirmed checkout date are subject to an early departure fee of 1 night's room rate +tax. The hotel is a 25-minute walk from the Pentagon City metro station, and there is shuttle service from the hotel to the station and back. The monuments and sights of Washington, D.C. are only two stops away on the Metro! There are many hotels in Arlington's Pentagon City area. (Here's one list.) However, the room rate at the host hotel is very competitive, and we recommend staying there. The hotel's website has further details concerning transportation to/from the hotel. The banquet will be in the rooftop Galaxy Ballroom in the Sheraton with spectacular panoramic views of the National Mall. The banquet tickets will be an optional additional cost of $60 per attendee or guests. Press activities are currently being planned for the Symposium. If you are presenting on results that may be if interest to the press, please indicate that when you submit your abstract.